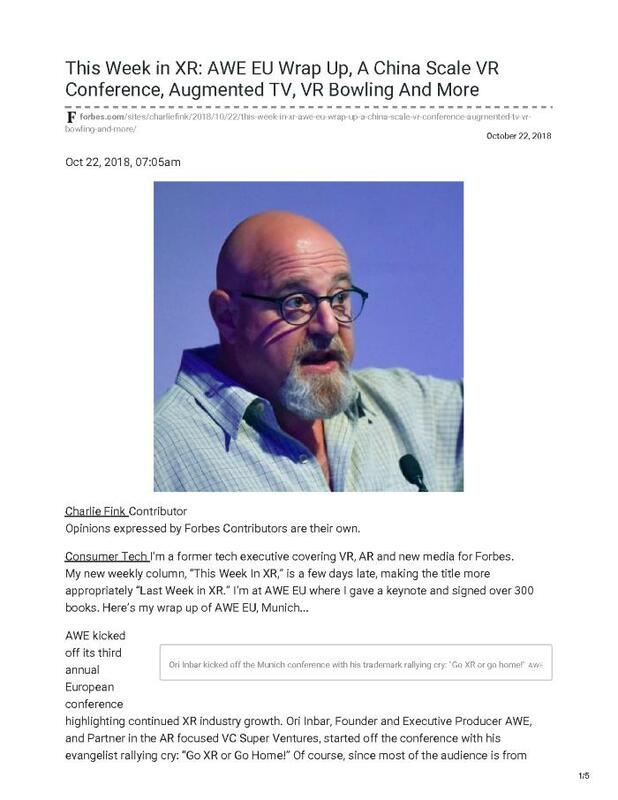 For this installment of his new weekly column, "This Week is XR", Charlie Fink reports from the AWE EU conference held in Munich, Germany. The conference began with founder of AWE Ori Inbar highlighting the continued growth of the XR industry. He says, "all signs point to rapid XR adoption by the Fortune 1000, big bets by tech, manufacturing and consumer giants, and record investment in the billions". Inbar also announced the launch of the Open AR Cloud (OARC) initiative, which was first mentioned at AWE USA 2018. Fink discusses many of the major company accouncements from the conference, including the official launch of Vuzix Blade commerical edition AR glasses (Ubimax's frontline AR system is now compatible with the Vuzix Blade), RE'FLEKT's new standard enterprise operating system, Bosch's new AR system for the automotive industry, RealWear's HMT-1 AR system is now being used by Colgate-Palmolive factory workers, and Visualix's new AR cloud localization system for warehouses.